Walter Sands, the endearing private eye of Dover Beach, is back. In this memorable sequel, the president of the United States has come to Boston. Her job: to convince New England to become part of the new government formed in the aftermath of the nuclear war that has destroyed much of America. Walter’s job: to protect her from a shadowy group intent on foiling her plan. But the president is kidnapped, and soon Walter becomes the prime suspect. Now, with the help of his friends, he must save her—and save himself. Like the post-nuclear world he is part of, Walter is bruised and battered, but he never gives up hope. 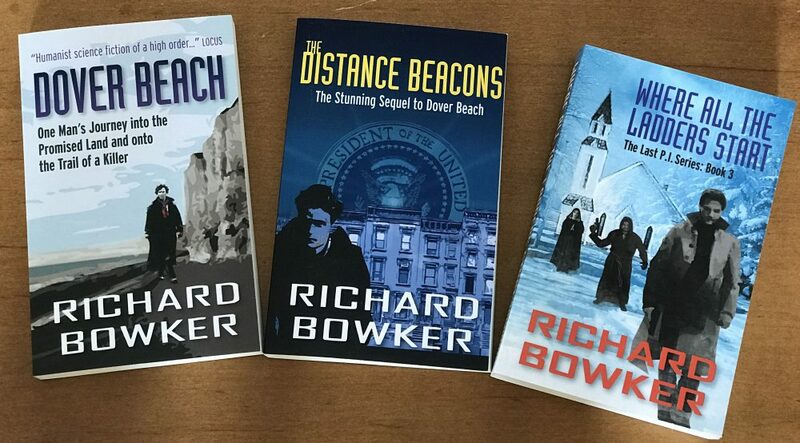 Filled with memorable characters, The Distance Beacons is funny, heart-breaking, and life-affirming. What I can’t believe is that no one else has reviewed this book. Perhaps it is because this is the second (and hopefully not the last) that Bowker has offered us. It has been a long, long time since I read this book, but I do remember it as a better than “a good ‘un”. Walter Sands, the only P.I. in a post-apocalyptic (no longer United) States is asked to search for a rebel organization that is threatening to assassinate the President when she comes to Boston to campaign in favor of the New England states to rejoin the union. Along with his friends and roommates, Walter uncovers much more than he or his employer expect. Another great read from Bowker. I think that I like it that he never really describes the nuclear war that created this future mish-mash country. It was what it was and now the survivors are just trying to rebuild their lives and perhaps a country that may or may not resemble the earlier version. There is no sweeping view of this time; there is just the observations of the people “on the ground” so to speak. Bowker knows how to keep the characters relevant and relate-able and how to build the tension in the story to keep the reader turning pages–or flipping screens. Worth the time where so many are not. It was one of those May days that make you wonder what’s so bad about being alive. Sun shining, birds singing, flowers blooming—the Earth seemed to have shrugged off the awful things we had done to her, and she was offering the same old beauty and warmth and hope that had always been her gift to us, It was the kind of day that could make you half-believe that nothing awful had happened. It was the kind of day you had to take advantage of, in case the Earth changed her mind. So why, I wondered, was I sitting in a dingy office on lower Washington Street, staring out into the sunshine and feeling sorry for myself? ~ Because I am a responsible professional, and anyone responding to my ad in the Globe would expect to find me here. ~ Because I don’t have an answering machine to take a message, should anyone try to call. Don’t have a telephone either, for that matter, so calling would not be easy. ~ Because I am a dreamer, still trying to live my dream. ~ Because I’m a fool. That seemed to about cover it. This is the life of the private eye, I told myself—the long stretches of boredom punctuated by the occasional burst of excitement. But this particular stretch was beginning to seem like a life sentence. I had arrived back in Boston from England in early January, having muddled through my first case, and there was nothing to do but set up shop once again. So I put a log in the wood stove and picked out a book from one of the many tottering stacks that littered the office. Then I said a prayer to the poster of Humphrey Bogart, my patron saint, who smiled a crooked but encouraging smile at me from the opposite wall, and I waited for the sound of footsteps on the dim staircase, the tentative rapping on the frosted glass door of my office. And I waited. I ran out of books. I used the wood stove less and less as the weather grudgingly improved. I went home every night and faced the uncomfortable silences as my friends tried not to ask me why I was wasting my life. And now a beautiful spring day was drifting away from me and my money was all but gone, but still I sat in my office, and stared out my window, and hoped. It wasn’t exactly what I was hoping for, of course: the mysterious blonde, dressed in black, desperate for my help; the dying man with a priceless figurine he could entrust to no one but me; the eccentric millionaire whose strange predicament only I could solve. Not this time, anyway. This time it was two young soldiers driving up in an ancient jeep. They parked and looked dubiously up at the building I occupied. I pulled back from the window. Wouldn’t do to appear too eager. I hurriedly tossed aside the book I was rereading and spread some papers on my desk in what I hoped was impressive-looking disarray. It occurred to me as they clomped up the stairs that these guys probably weren’t interested in my professional services. Why would soldiers need a private eye? I tried to think if I had broken any laws lately that would merit an official visit. I was hardly a model citizen, but surely the government had more important things to do than bother with an insignificant private eye. Besides, the local police, not Federal troops, would be the ones to arrest the likes of me. But you never can tell. They rapped on the frosted glass door. “Come in,” I said in a busy but welcoming tone. The door opened, and the two soldiers entered. The first one in was short and had a spray of acne on his face. The other was lantern-jawed and hung back a little, as if loath to deal with the strange creature sitting behind the desk. Both had the requisite army haircut, so short they might just as well have been bald. I could have continued the interrogation indefinitely, but it would have been pointless. I had been a soldier once, not so very long ago, and I knew the situation he was in. He was supposed to be as polite as possible but say nothing. And he was to come back with me. No excuses accepted. I decided to ask one more question. “What’s your name?” I asked. I smiled. “Hi, Danny. And you?” I asked the lantern-jawed fellow. I winked at Saint Humphrey as I followed the soldiers out the door. I was a little excited as I got into the jeep. Anyone who could send troops to fetch me had to be a big shot. A government big shot, to be sure, but even dealing with the Feds was better than staring out the window. We headed up Washington Street, with Gus doing the driving. Except for another government jeep or two, and a couple of cop cars, we were in the only motor vehicle to be seen. Not that we had the streets to ourselves. Gus had to bully his way past the pedestrians and the cyclists and the horses and even a few pigs; traffic was actually pretty thick around Downtown Crossing and the Salvage Market. No one seemed particularly interested in getting out of our way; there were the usual sullen stares, and the occasional utterly hostile ones. But still we made progress. VOTE YES, the red, white, and blue posters urged us from the otherwise useless telephone poles and mailboxes. I did my best to ignore the posters. “Where are you guys from?” I asked. “Out of state, sir,” Danny replied. They hated it. They were scared and lonely and not used to being around people who didn’t like or trust them. They couldn’t figure out why they were being forced to do this, and they just wanted to get it over with and go home. At least, if they were anything like me when I was a soldier, that’s the way they felt. “Write letters,” I suggested. Danny stared at me, then nodded silently. It occurred to me that he might not know how to write. Gus took us to Government Center, on the far side of Beacon Hill. I wasn’t surprised. We stopped in front of the John Fitzgerald Kennedy Federal Building, and the two soldiers escorted me inside. There were more VOTE YES signs in the lobby. Seemed like a waste of time to me: preaching to the converted. The lobby was air-conditioned; soft fluorescent lights shone down on us; the elevator that we waited for actually worked. Sometimes I’ve thought that it would have been better if all the elevators had stopped working forever after the War, if there were no more touch-tone telephones and laptop computers and stick-shift sedans and CAT scans. If all of that stuff was just a temporary aberration of a society that didn’t quite work out, then we could maybe shrug our shoulders and go back to living the way human beings had lived for thousands of years before such wonders existed. But the wonders still existed, damn them. You could get almost anything you wanted (short of a nuclear reactor, maybe) if you had enough money or ingenuity or luck; I had certainly proved that, when I jetted over to England for my first case, then jetted back in triumph (more or less). And that meant we had to live with these constant reminders of what had been lost, of what was once so common and now shimmered just out of our reach, and it was almost impossible to go through life without a daily dose of self-pity. Dealing with the Feds was a sure way to keep the dose high; they treated themselves pretty well, and were not inclined to hide it. To keep us all striving to regain what had been lost, their supporters might explain. Because they have the power and use it for their own benefit, their opponents would retort. My, my, I thought. A big shot indeed. The guard gave a nod to my two pals. He frisked me, but I was clean—I had left my revolver back at the office. “You can go inside now, Mr. Sands,” Danny said when the frisking had been completed. “Thank you. And thanks for the ride.” I smiled. Danny looked uncomfortable for a moment, and then said, “Good luck.” Then he and Gus walked off down the corridor. Why did I need luck? I wondered. I went inside. She was a pleasant-looking blond, maybe a bit old for my taste, and maybe with a bit too much makeup on—nobody wore makeup anymore. But she had the kind of figure you can only get when you you’re allowed to shop at the Feds’ own grocery store. I smiled at her. “What’s your name?” I asked. She stared at me as if I were a particularly disgusting mutant. Friendliness doesn’t always work. I let the smile fade, and I wandered over to a leather couch, where I parked myself while the secretary ignored me and I awaited the governor’s pleasure. I tried to imagine what he wanted with me. Something to do with the VOTE YES posters? Security at the polls, maybe. I’d rather be staring out my office window, I thought. But surely Governor Bolton didn’t bother himself with details like who to hire for security. Maybe he had a priceless figurine…. Whatever he wanted, I knew that this was going to be an interview. So I tried to prepare. I considered Governor Bolton. He had been around for a long time now—about eight years, I figured. The Feds had appointed him governor of the New England region shortly after their troops came up from Atlanta and put a stop to the anarchy that had been plaguing us for years. And in the time since then he had become the symbol of the Federal presence here: tough, distant, and a little bit mysterious—at least to me, who didn’t spend a great deal of time thinking about such things. What did the Feds want from us? What was in the occupation for them? The taxes they managed to collect didn’t pay their expenses; the men and women they drafted (like me) didn’t make up for the number of troops they had to commit to the region. So why bother? In a way, the most mysterious thing about Bolton was that he was a local. Somebody—probably my buddy Stretch—had told me that Bolton had sold real estate before the War. Not a lot of call for real estate salesmen in this new world, where mansions were free—all you had to do was be able to defend them. But somehow he had landed on his feet. And somehow he had made the Feds trust him enough to put him in charge of the region where he had grown up. And somehow it didn’t bother him that many—perhaps most—of his fellow locals thought of him as a semi-traitor, zealously carrying out the edicts of the well-fed rulers from down south. Or maybe it did bother him. How would I know? To me, he was just a photo in the Globe and a bunch of rumors. After a while I began to wonder if he would ever be anything more. Men wearing suits and ties came and went. The blond secretary had a smile for most of them. No one paid any attention to me, except perhaps to glance at my Salvage-Market jersey and jeans and wonder how I had gotten past the guard. This was not much better than being in my office. I didn’t even have a book to read. Finally the summons came. “The governor will see you now,” the secretary said. I got up and smiled at her. “Thanks a lot,” I said. She pointed silently to a door. I walked over to it and knocked. “Come in,” a loud voice responded. I went in. Governor Bolton was sitting behind a huge mahogany desk, flanked by the American flag and some other flag with what looked like a Native American on it. It took me a second to retrieve the flag’s identification from my freakishly complete memory. It was the Massachusetts state flag. This struck me as somewhat incongruous, since Massachusetts didn’t really exist as a separate political entity in the Feds’ scheme of things. There were no VOTE YES posters. Bolton was scribbling on a piece of paper—or maybe, I thought, he was pretending to scribble, so I could see he was a busy man and a great deal more important than me. I was willing to concede the point. “Have a seat,” he said, continuing to scribble. I sat. The chair was a little too low; I found myself staring up at the governor. He had gray hair, cut short, and a long scar next to his right eye. I hadn’t noticed the scar in the photos I had seen of him; it made him look even tougher than my image of him—he was a man who took risks, the scar said, a man who understood physical danger. He was wearing a white shirt. His tie was loose; his shirtsleeves were rolled up. He was ready for action. After an appropriate interval he put his pen down and looked at me. “Walter Sands,” he said. His voice was deep and powerful. It sounded out of place in a private conversation; it should have been addressing a political rally. “Pleased to meet you,” I said. I smiled. The governor didn’t smile back. “Did my bodyguards treat you well?” he asked. I nodded in turn. Mr. Moseby is my pal Stretch, and I would have killed him if he hadn’t recommended me quite highly. “How did you get my name?” I asked. “Uh-huh.” The article in the Globe had been written by another friend, named Gwen Phillips. I have a lot of friends. Gwen and Stretch are the ones I live with. “Still, there might be circumstances where a person with your skills and contacts might be useful.” He was dithering, I could tell. A common problem with clients, my extensive reading of private eye novels had told me. It’s tough to tell someone you’ve got a problem. Maybe his wife is cheating on him, I thought. But no—I’d heard he was a widower. My heart sank. He did want me to guard some damn voting booth. The referendum was the latest development in the Federal government’s relationship with its fractious stepchild. It was a simple enough question that the Feds wanted us New Englanders to answer: “Do you support the government of the United States of America?” But the ramifications of their asking the question, and our answering it, had kept a lot of people in a tizzy all spring. “Now is no time to be apolitical!” Bolton thundered. It seemed to me to be as good a time as any to be apolitical. “Why not?” I asked. He sounded as if he was expecting a round of applause from his audience. “That’s great,” I said. “It’s the first time since before—” He waved his hand. I knew what the wave of the hand meant. People still had difficulty mentioning the War. Maybe if we were all very quiet about it, it would retroactively go away. “She’s coming here to get us to vote for the referendum?” I guessed. “Precisely.” Bolton stood up and stared out his window. He was shorter than I expected. Maybe that’s why my chair was so low. All of a sudden he looked a little silly to me as he stood next to the American flag—as if he were playing at being governor. And I wondered just how tough he really was. Maybe he still thought of himself as a real estate agent, and couldn’t really believe where life had brought him. I wondered if, in his heart of hearts, he thanked God for the War and the opportunity it had granted him. There had to be a few people around who thought like that. My mind was wandering. It returned when Bolton started to speak. “This referendum is important, Sands,” he said. “New England is part of America. People have to understand this—they have to believe this. They complain about the emigration controls and the out-of-state troops and the privileges for government workers, but they forget about what the government saved them from—and they forget about their heritage. We can’t just let our heritage slip away from us. Bolton sounded as if he were giving a speech himself. But his delivery was curiously rushed, as if this was a speech he was rehearsing for a different audience. I didn’t mind, but I was still trying to figure out what all this had to do with me. “You want me to protect the president while she’s here?” I guessed. “Not quite.” He returned to his desk. He took a piece of paper out of the top drawer and handed it to me. I read the message typed on it. We know Kramer plans to come. Boston is ours. If she comes, she faces our wrath. The Second American Revolution: TSAR. I didn’t like the sound of that acronym. I studied the message, and then returned the sheet of paper to Bolton. “Have you heard of this group?” he asked. Bolton gave me a look that told me what he thought of my career. I took a deep breath and shook my head. Bolton picked up his phone. “Lisa, get me General Cowens,” he said, and he replaced the receiver. Lisa, I thought. The blond secretary, presumably. Nice name. And then I thought: I’m not sure I like having General Cowens in on this. The governor’s scar seemed to throb. He looked much more impressive sitting down; he looked like the kind of man who could make threats and carry them out. I decided it was time to start worrying.